My wonderful friend Swathi, who you may already know as one of my fellow co-hosts at the Hearth and Soul hop, recently asked me to do a guest post for her. I was very pleased to be asked, and decided to share one of my favourite muffin recipes. 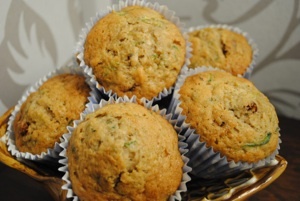 My Sweet and Spicy Zucchini Muffins are made with lots of wholesome ingredients. Although the pretty green flecks in these colourful muffins do give away the fact that they contain healthy stuff, even kids seem to love them. Please click here to head on over to Zesty South Indian Kitchen for the recipe!